After losing two quick wickets, Prithvi Shaw steadied the ship for Mumbai and showed great composure and determination against a probing Andhra attack. Once again making headlines for his fabulous run with the bat, Mumbai's teen prodigy Prithvi Shaw has continued his sublime form in the ongoing Ranji trophy. The 18-year old batsman slammed his fifth first-class hundred in his seventh 7th match for Mumbai. Shaw's century took Mumbai from a precarious position of 64/3 to 162/3 after 53 overs against Andhra Pradesh on Friday. He played a brilliant knock of 114 off just 173 deliveries at a strike rate of 65.90. The right-hander stroked 14 boundaries and one solitary six in his innings. Shaw was finally dismissed in the 61st over by Ayyappa Bandaru leaving Mumbai at 189/4. At a young age of 18 years and 8 days, Shaw had 5 first-class hundreds against his name. He has scored 4 centuries in the Ranji Trophy for Mumbai. Shaw is only behind master blaster Sachin Tendulkar (7 tons) in terms of scoring most number of first-class hundreds at the age of 18. Interestingly, Shaw's fourth ton came against Odisha earlier this month, he hit a 105 off 153 balls at an impressive strike rate of 68.63. 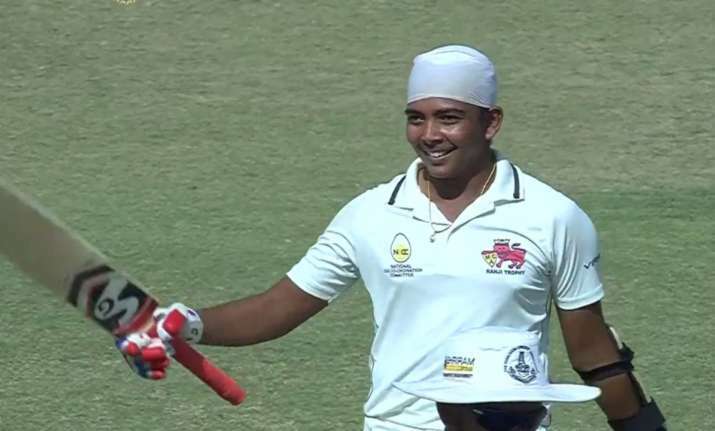 After scoring a sensational ton on his Ranji Trophy debut, Shaw becomes the youngest player to score a century on his Duleep Trophy debut as well. While representing Indian Board President's XI against New Zealand in a one-day warm-up game, the young batsman also drew praise from experienced pacer Trent Boult who had bowled to him during the contest.